Whale sharks can be found in all temperate and tropical oceans around the world, with the exception of the Mediterranean Sea. Measuring up to 45 feet in length, these giants subsist on a diet of krill, squid and small fish. 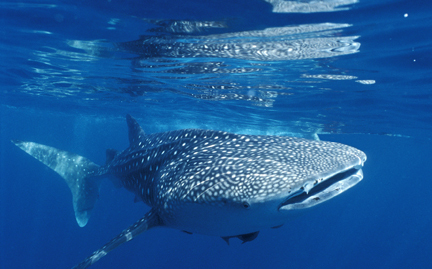 It is thought that whale sharks may have a lifespan of 100 to 150 years. The whale shark is a filter feeder, one of only three species of shark that feed by sucking water through its mouth and expelling it through the gills, trapping millions of plankton. These gentle creatures are at risk from commercial fishing for food.